A cholecystectomy is performed to treat cholelithiasis and cholecystitis. In cholelithiasis, gallstones of varying shapes and sizes form from the solid components of bile. The presence of stones, often referred to as gallbladder disease, may produce symptoms of excruciating right upper abdominal pain radiating to the right shoulder. The gallbladder may become the site of acute infection and inflammation, resulting in symptoms of upper right abdominal pain, nausea and vomiting. This condition is referred to as cholecystitis. The surgical removal of the gallbladder can provide relief of these symptoms. Although the laparoscopic procedure requires general anesthesia for about the same length of time as the open procedure, laparoscopy generally produces less postoperative pain, and a shorter recovery period. The laparoscopic procedure would not be preferred in cases where the gallbladder is so inflamed that it could rupture, or when adhesions (additional fibrous bands of tissue) are present. The laparoscopic cholecystectomy involves the insertion of a long narrow cylindrical tube with a camera on the end, through an approximately 1 cm incision in the abdomen, which allows visualization of the internal organs and projection of this image onto a video monitor. Three smaller incisions allow for insertion of other instruments to perform the surgical procedure. A laser may be used for the incision and cautery (burning unwanted tissue to stop bleeding), in which case the procedure may be called laser laparoscopic cholecystectomy. As with any surgical procedure, the patient will be required to sign a consent form after the procedure is explained thoroughly. Food and fluids will be prohibited after midnight before the procedure. Enemas may be ordered to clean out the bowel. If nausea or vomiting are present, a suction tube to empty the stomach may be used, and for laparoscopic procedures, a urinary drainage catheter will also be used to decrease the risk of accidental puncture of the stomach or bladder with insertion of the trocar (a sharp-pointed instrument). Post-operative care for the patient who has had an open cholecystectomy, as with those who have had any major surgery, involves monitoring of blood pressure, pulse, respiration and temperature. Breathing tends to be shallow because of the effect of anesthesia, and the patient's reluctance to breathe deeply due to the pain caused by the proximity of the incision to the muscles used for respiration. The patient is shown how to support the operative site when breathing deeply and coughing, and given pain medication as necessary. Fluid intake and output is measured, and the operative site is observed for color and amount of wound drainage. Fluids are given intravenously for 24-48 hours, until the patient's diet is gradually advanced as bowel activity resumes. The patient is generally encouraged to walk 8 hours after surgery and discharged from the hospital within three to five days, with return to work approximately four to six weeks after the procedure. Cholecystitis — Infection and inflammation of the gallbladder, causing severe pain and rigidity in the upper right abdomen. Cholelithiasis — Also known as gallstones, these hard masses are formed in the gallbladder or passages, and can cause severe upper right abdominal pain radiating to the right shoulder, as a result of blocked bile flow. Gallbladder — A hollow pear-shaped sac on the under surface of the right lobe of the liver. Bile comes to it from the liver, and passes from it to the intestine to aid in digestion. Care received immediately after laparoscopic cholecystectomy is similar to that of any patient undergoing surgery with general anesthesia. A unique post-operative pain may be experienced in the right shoulder related to pressure from carbon dioxide used through the laparoscopic tubes. This pain may be relieved by laying on the left side with right knee and thigh drawn up to the chest. Walking will also help increase the body's reabsorption of the gas. The patient is usually discharged the day after surgery, and allowed to shower on the second postoperative day. The patient is advised to gradually resume normal activities over a three day period, while avoiding heavy lifting for about 10 days. Potential problems associated with open cholecystectomy include respiratory problems related to location of the incision, wound infection, or abscess formation. Possible complications of laparoscopic cholecystectomy include accidental puncture of the bowel or bladder and uncontrolled bleeding. Incomplete reabsorption of the carbon dioxide gas could irritate the muscles used in respiration and cause respiratory distress. "Gallstones and Laparoscopic Cholecystectomy." Centers for Disease Control and Prevention. 〈http://www.cdc.gov/nccdphp/ddt/ddthome.htm〉. "Patient Information Documents on Digestive Diseases." National Institute of Diabetes and Digestive and Kidney Disease. http://www.niddk.nih.gov. excision of the gallbladder, usually done to relieve the symptoms of cholecystitis associated with gallstones. During the operation a dye may be injected directly into the biliary ducts and a cholangiogram done to determine whether there are any stones within the ducts. 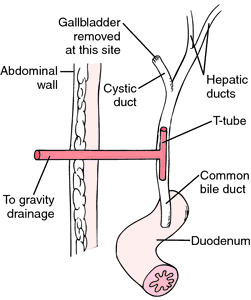 If stones are known or suspected to be in the common bile duct, a T-tube is inserted to bypass the calculi and allow drainage of bile. The end of the tube is brought to the outside through a stab wound in the upper right quadrant and attached to a drainage bag. In spite of the intraoperative cholangiography, some patients will retain stones in the common bile duct after the surgery. laparoscopy is commonly used, which allows most patients to go home on the same day as surgery and return to full activity within a week. Patient Care. During the preoperative period the patient will be given a thorough physical examination as well as specific tests for liver function and either radiologic or endoscopic studies of the gallbladder and biliary drainage system. Because nausea and flatulence are common problems in these patients, a nasogastric tube usually is inserted and attached to a decompression apparatus prior to surgery. When the patient returns from surgery a careful check is made for drainage tubes inserted during the operation. Sometimes the drains are devised so that bile and serous fluid from the operative site drain directly onto the surgical dressings. Other drains or tubes such as a T-tube or Y-tube are attached to a drainage bag so that the amount of bile removed can be measured periodically. In either case, dressings over the wound are checked frequently for signs of bleeding or other abnormalities in the character and amount of drainage. When bile leakage is copious, as it sometimes is, the dressings will need to be reinforced and the outer layers changed as often as necessary to keep the patient dry and comfortable and to avoid irritation of the skin around the incision. The nursing care plan of a patient with either a T-tube or a Y-tube should take into account three major potential problems: infection, obstruction, and dislodgment of the tube. Monitoring for infection includes watching for elevation of body temperature above 100° F and inspection of the tube insertion site for redness, swelling, warmth, and purulent drainage. The patient also is watched for jaundice and complaints of pain in the right upper quadrant, drainage around the tube when it is clamped, nausea, vomiting, and very dark urine and clay-colored stools, all of which indicate obstruction of the common bile duct. The amount of drainage from the tube is measured and recorded at least once every eight hours. A marked decrease in amount could mean that the tube has become dislodged. Biliary tract disease continues to occur in approximately 5 to 8 per cent of all postcholecystectomy patients. The symptoms can appear within weeks after surgery or may occur years later and are the result of residual stones not removed at the time of surgery, newly formed gallstones, or stricture of the common bile duct. Infections and malignancies also can produce the symptoms of postcholecystectomy syndrome (PCS). Because of hormonal influences, women in the 40- to 49-year-old age group account for almost 80 per cent of patients with PCS. Treatment of the condition varies, but might entail more extensive surgery to provide a means by which bile can drain into the intestines. Placement of T-tube following cholecystectomy. From Monahan et al., 1994. Surgical removal of the gallbladder. /cho·le·cys·tec·to·my/ (-sis-tek´tah-me) excision of the gallbladder. the surgical removal of the gallbladder, performed to treat cholelithiasis, cholecystitis, and gallbladder cancer. Surgery may be delayed while the acute inflammation is treated. Before surgery an electrocardiogram and tests of hepatic function may be ordered. Under general anesthesia, the gallbladder is excised and the cystic duct ligated, the common duct is explored, and any stones found are removed. The most common complication is disruption of the hepatic or other ducts of the biliary system, requiring surgical correction. Wound infection, hemorrhage, bile leakage, and jaundice may also occur. When possible, cholecystectomy is done as a laparoscopic procedure. See also cholecystitis, cholelithiasis. Surgery The surgical removal of the gallbladder Indications Gallstones, cholecystitis, cancer. See Bile, Cholecystitis, Gallstones, Laparoscopic cholecystectomy. Acute, chronic, or acalculous cholecystitis (biliary inflammation that is not caused by gallstones), repeated episodes of biliary colic, biliary dyskinesia, gallstone pancreatitis, and occasionally cholangitis are indications for the procedure. The gallbladder does not usually need to be removed for asymptomatic gallstone disease. Preoperative: The patient is informed about the procedure, including the need for drains, catheter, nasogastric tubes, etc., and taught about incentive spirometry, leg exercises, incision splinting, analgesia use, and other postoperative concerns. Postoperative: General patient care concerns apply. Vital signs are monitored and dressings are inspected. The patient is assessed for pain and for gastrointestinal and urinary function; analgesics and antiemetics are provided as needed. Fluid and electrolyte balance is monitored, and prescribed fluid replacement therapy is administered until the patient is permitted oral intake. The patient is encouraged to breathe deeply and to perform incentive spirometry to prevent atelectasis and impaired gas exchange. The patient is assisted with early ambulation and with splinting the abdomen when moving about or coughing. Peripheral circulation is evaluated, and venous return is promoted with leg exercises and elastic stockings or pneumatic hose as prescribed. If a laparoscopic approach is used, the patient will typically be discharged the day of or the day after surgery. Clear liquids are offered after recovery from general anesthesia, and the patient resumes a normal diet within a few days. If an open incision is used, the patient is placed in a position of comfort; a nasogastric (NG) tube is frequently required to prevent abdominal distention and ileus, and is attached to low intermittent suction; and the volume and characteristics of drainage from the NG tube and any abdominal drains or T-tube are documented. Skin care and appropriate dressings are provided around any drain site. When peristalsis returns, the NG tube is removed as directed. Oral intake, beginning with clear liquids, is initiated. The T-tube may be clamped before and after each meal to allow additional bile to enter the intestine. Signs and symptoms of postcholecystectomy syndrome (fever, abdominal pain, and jaundice) and other complications involving obstructed bile drainage are reported; urine and stool samples are collected for analysis of bile content should any such complications occur. Discharge teaching for the patient and family includes wound care and T-tube care if appropriate (the T-tube may remain in place up to 2 weeks); the need to report any signs of biliary obstruction (fever, jaundice, pruritus, pain, dark urine, and clay-colored stools); the importance of daily exercise such as walking; avoidance of heavy lifting or straining for the prescribed period; and any restrictions on motor vehicle operation. Although diet is not restricted, the patient may be more comfortable avoiding excessive intake of fats and gas-forming foods for 4 to 6 weeks. Arrangements for home health follow-up or care may be necessary. The patient should return to the surgeon for a post-operative evaluation visit as scheduled. If gallstones were present, the patient is taught to reduce the risk of recurrence by maintaining normal body weight, exercising regularly, and eating three well-balanced meals daily, including fiber and calcium and avoiding alcohol and foods high in saturated fat. Weight loss, if needed, should be carried out gradually, and crash dieting discouraged. Surgery for gallbladder cancer in which the organ and surrounding tissues (the neighboring liver and regional lymph nodes) are removed. Removal of the gallbladder using a laser as a cutting tool, applied laparoscopically. This procedure may be inappropriate for patients with severe acute cholecystitis, a palpable gallbladder, or evidence of a stone in the common bile duct. The use of a laser as opposed to endoscopic electrosurgical instrument is according to the preference of the surgeon. The nurse or surgeon explains to the patient that this type of surgery will not be used if the patient is pregnant or has had extensive abdominal surgery (because of concern for adhesions), severe acute cholecystitis, a palpable gallbladder, evidence of a stone in the common bile duct, or a bleeding problem. The patient is also told that the surgeon, using the endoscopic technique, will be able to remove the gallbladder without unsightly scarring, leaving only four (or less) small punctures, which reduces the risk for wound complications (infection, hematoma, separation). Risks for other complications (pneumonia, thrombophlebitis, urinary retention, and paralytic ileus) are also decreased because the procedure enables early mobility and may avoid use of parenteral analgesia. Patients will experience less pain and immobility, require less narcotic analgesia, be discharged on the same or on the next day, and be able to return to their usual activities (including work) within 7 days. Preoperative preparation, which usually is similar to that for any other abdominal surgery, is explained. The patient is instructed to keep the adhesive bandages covering the puncture site clean and dry. He may remove them the next day and bathe or shower as usual. The patient most likely will require little analgesia, but a prescription is given for use as needed. He is reminded to pace activity according to energy level. While no special diet is required, the patient may wish to avoid excessive fat intake and gas-forming foods for 4 to 6 weeks. He should return to the surgeon for follow-up evaluation as directed and report any vomiting, abdominal distention, signs of infection, and new or worsening pain. Surgical removal of the gall bladder. Q. What is a cholecystectomy and how is it done? My Doctor diagnosed me with gallstones and said I have to have a cholecystectomy surgery. What is this and how is it done? A. Cholecystectomy is a surgery in which the gallbladder is removed. Don't be alarmed since you can live without your gallbladder. When the gallbladder is gone, bile flows directly from the liver into the small intestine. You will probably have a laparoscopic cholecystectomy, which means a surgeon will make a small slit in your abdomen, then insert a tubelike instrument which has a camera and surgical instruments attached. This is used to take out the gallbladder with the stones inside it. This procedure causes less pain than open surgery, is less likely to cause complications, and has a faster recovery time. This surgery is performed in an operating room and you will be under general anesthesia. It usually takes 20 minutes to one hour. The commonly used anaesthetics are bupivacaine, ropivacaine and morphine and these are administrated after cholecystectomy surgery. Our study included 150 consecutive laparoscopic cholecystectomy patients between October 2014 and November 2015. 4) Since the performance of the first open cholecystectomy by Carl Langebuch of Germany (1846-1901) and the first laparoscopic cholecystectomy by Prof. In some center of the world, cholecystectomy is being done by SILS and NOTES (Natural Orifice Trans luminal Endoscopic Surgery) and results claimed are superior to that of the conventional four port cholecystectomy. On comparing surgical outcomes between these two years, significantly more patients underwent laparoscopic cholecystectomy in 2014 (241(92. Antibiotics in acute calculous cholecystitis - do Tokyo guidelines influence the surgeons' practices? Laparoscopic subtotal cholecystectomy for severe cholecystitis. 21%), by presenting this case we wish to emphasize the importance of timely conversion and execution of intraoperative cholangiography during cholecystectomy in all cases when identification of the structures of Calot's triangle is not clear enough (12-15). Even recent advances in the diagnostic imaging modalities rapidly develops, it is still difficult to differentiate tumorous polyps from non-tumorous ones before surgery, thus there is no general agreement about the indications for cholecystectomy (3, 7, 13). Is it necessary to perform prophylactic cholecystectomy for all symptomatic gallbladder polyps diagnosed with ultrasound? The objective of this study was to report the frequency of various histo-morphological lesions in cholecystectomy specimens and to highlight the importance of histopathologic examination of each and every specimen of gall bladder. Bile duct injury during laparoscopic cholecystectomy and survival in medicare beneficiaries. Port site hernia following laparoscopic cholecystectomy. For example, in patients scheduled for cholecystectomy under general anesthesia, intraoperative low-dose ketamine infusion provides good postoperative analgesia and reduces the need of opioid analgesics.